How can I find my format and facility code? A proximity card stores data. A "format" is the structure of the binary data stored in the card. The number of ones and zeros, and how they are put together, determines the format and ultimately the credential number. When a card is waved in front of a reader, those numbers are sent to the access controller. However, the controller needs to know how the received information is organized., i.e. the format. For example, if we see a string of numbers, 9395981699, it may mean nothing to us. But, if we know it s a USA phone number, then it is immediately understood that 939 is the area code, and the rest of the numbers, the phone number. Then, knowledge of the format allows to properly decode the data. The 26 bit Wiegand standard format is the industry standard. Card manufacturers such as HID, Indala and AWID sell cards with this format to any dealer. This 26 bit format is recognized by all access hardware. Over the years, formats with a higher number of bits (33, 37, 48, 50) have been added to increase card security. However, some of the higher bit formats are "proprietary", and usually carry a higher price tag. One exception is the HID 37 bit proprietary format, priced similarly to a 26 bit card. Every card has a consecutive serial number programmed, assigned in your access control software to a cardholder. For 26 bit cards, it can go from 0 to 65,535. But, what if two companies share the same card numbers? They could access each other´s premises. To reduce this risk, a second number, know as facility or site code is encoded into each card. This number can go from 0 to 255 on a 26 bit format card. To grant access, an access control system validates the facility code AND the serial number. Company A will reject Company B cards, and viceversa, even if they have the same serial number, because the facility code does not match. Lately, some formats have a greater number of bits, and make obsolete the notion of facility codes, because the card serial number (like the serial number on currency bills) is never duplicated at the factory. This also means faster delivery of cards, even for add-ons to existing sites, right out of stock. Cards ship with a facility code (if used) and serial number programmed. 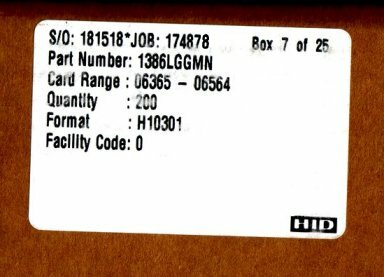 How can I find the part number, format and facility code? For a small fee , we can do the job of finding the programming specs for you. 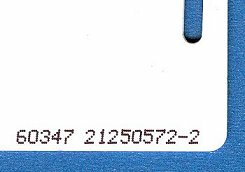 Please take a working card sample and e-mail us the small numbers printed near the edge (see example at right for an HID ProxCard II card). We will use this info to check the HID database and locate the format and facility code for you. For security reasons, we will provide this info only to established companies and institutions. We are unable to answer requests coming from free email (Yahoo!, Hotmail, Gmail...) addresses. If your installation is new, we can help you to select the format and facility code for you.